L-Lysine - An essential feed ingredient. Lysine is an amino acid essential to warm-blooded monogastric animals and humans. It has been isolated from casein in1889. For half a century L-lysine has been manufactured using bacterial fermentation of carbohydrates. Lysine was commercially introduced as a feed additive around 1960. The now dominant method of industrial production of lysine is based on fermentation of beet and cane sugar or starch sugars. It was Kyowa Hakko Kogyo Company in Japan, which first produced fermented L-lysine in 1978. Lysine exists as stereoisomer's and a racemic mixture of L- and D-forms is obtained by a pure chemical synthesis. Because only the naturally occurring L-lysine form is physiologically active, it is necessary to introduce a biological step in the manufacturing process. This part is carried out by fermentation in bioreactors. This requirement for the L-form is a strong constraint on the manufacturing techniques for amino acids and has tended to favor biosynthesis or extraction from natural products. Lysine is today manufactured almost exclusively by fermentation processes. Corynebacterium glutamicum and related strains are useful microorganisms. Crystallization of the fermented concentrate facilitates its isolation and purification, but also modern ion exchange resins and membranes are applied in high grade products. Choice of raw material is geographically specific. Sugar from beet and cane is the obvious choice in regions with intensive sugar manufacturing. Starchy crops are, however, cultivated as economically and feasible as cane and beet. Thus, High Fructose Syrup based on corn had in the United States demonstrated an explosive growth and largely supplanted cane sugar for industrial applications. To replace the traditional sugar and molasses as carbohydrate source in the amino acid fermentation all needed is a starch and glucose front end to be added to the fermentation plant. Not only the sugar, but corn has recently become part of a biofuel economy. This may be the reason behind a new trend towards the use of cassava, which can be grown and harvested in the tropical belt round the year a big advantage. Lysine production will for this reason gradually migrate to tropical or subtropical areas with cheap sources of carbohydrates. A typical process based on cassava begins in the field, where cassava roots are lifted, trimmed and transported to the factory for immediate processing. First step on the factory - washing and peeling is carried out continuously on dry and wet rotating screens. The clean roots are chopped and grated to a fine pulpy mass. The starch is extracted on conical rotating screens by flushing the pulp with the root juice itself leaving the residual wet pulp as a by-product useful as cattle feed or soil improver. The extracted crude starch suspension crude starch milk is separated from the juice on hydrocyclones. The juice is eventually discarded as a by-product useful as a natural fertilizer or preferably turned into bio gas powering the plant. The concentrated crude starch milk is refined on multi stage hydrocyclones in concurrent with fresh water leaving the last stage as a pure concentrated starch slurry with 21o Baum. There is no need to dry the starch. Better is to hydrolyze it right away into glucose syrup starch sugar syrup replacing the traditional cane and beet sugar as feed for the microbes. First step in this transformation is liquefaction of the starch by acid or alpha-amylase. This step will hydrolyze the starch into shorter chains of polysaccharides with a rater low Dextrose Equivalent (DE) preparing it for the second step the saccharification. The liquefaction is followed by a more complete saccharification to a high DE hydrolysate with amyloglucosidase to a mixture of the monosaccharide dextrose and smaller amounts of the disaccharide maltose and lower polysaccharides. This intermediate product will replace the traditional beet and cane sugar in the subsequent fermentation. In this method bacteria are grown aerobically in a liquid nutrient medium with the starch sugar syrup as the carbohydrate constituent and ammonia as the nitrogen source. The growth media must also contain minerals and growth factors often obtained from corn steep liquor but the cassava juice may serve as well. To ensure proper digestion of the carbohydrate, the fermentation is carried out as a batch operated process and to provide the time required the bioreactors are made to hold large volumes. The feed is prepared in the fermentation kitchen, UHT-sterilized and transferred to the pre-sterilized bioreactors. The bacterial culture is propagated on a small scale and up-scaled a few times before the feed is inoculated. Filtered sterile air is supplied throughout the digestion. A temperature of about 30 to 35 C is maintained during the fermentation period. It is preferred to maintain pH in the range of about 6.5 to 7.0 throughout the fermentation cycle typical lasting 3 - 5 days. For adjusting pH, conventional agents, such as inorganic or organic acidic or alkaline substances may be used. The bacteria selected for this process excretes the amino acid they synthesize outside of their cell membrane. The lysine accumulates in the fermentation broth as an aqueous solution of lysine. The broth itself is a valuable feed supplement. It contains other amino acids as well. The solution may be pH-adjusted and condensed by evaporation - ready for use as Liquid Lysine an ideal product provided a nearby market. Spray drying the same concentrate is a simple method when a powder is required. The lysine content is typical above 60% calculated on dry matter as the L-Lysine.HCL equivalent. The accompanying other amino acids represent a bonus value of 5-15% dependent on actual recipe. A slightly higher grade may be manufactured just by filtering the broth before spray drying. Annual capacities of 10.000 MT lysine and upwards are common. A plant put up in USA by Archer-Daniels-Midland (ADM) 1989 made to produce 60.000 MT per year has now reached 150.000 MT. Most lysine is made as feed grade on the monochloride form. The strength of other forms like sulphates is usually expressed as their monohydrochloride equivalent. Lysine is an essential amino acid used as an additive to pig and poultry feed. 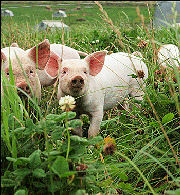 Lysine is the first restrictive amino acid with pigs and the second restrictive amino acid with poultries. The first restrictive amino acid determines how much protein is utilized. All essential amino acids can only be utilized, if the first restrictive amino acid is present in the feed stuff in an amount covering the animals' needs. By balancing the feedstuff with lysine an improved economy for the farmer is achieved. With lysine it is possible to create low protein diets, which is beneficial for both economy and the environment. Lysine is one of three amino acids in large scale production, comprising 98 % of total world amino acid production. DL-methionine (inclusive its hydroxy analogue, MHAn). Ajinomoto Animal Nutrition Group, the world's largest lysine producer, makes 3-400.000 MT on six overseas production bases. Kyowa Hakko in Japan and Sewon in South Korean are important players. Global Bio-Chem Technology, China entered the market rather late, but is already a large manufacturer with an annual lysine output of 200,000 MT. In Denmark VitaLys I/S is since 2004 producing their own brand VitaLys and is meeting the domestic demand. VitaLys is available as powder and liquid with a strength of 60-65% calculated as Lysine.HCl on dry matter. The market price is strongly correlated with the spread (The price difference between soybean meal and corn on the Chicago grain trading floor (CBOT)). Linear programming is the single most important tool for the composition of a feed. From constraints due to animal nutritional needs and technical considerations as well as knowledge of the composition of a range of feed materials and their price is the optimal feed compound calculated. The computer calculates, among other things, the necessary quantity of lysine and other amino acids to be used to exploit feed materials low in amino acids. Rapid analytical methods and fast computing have paved the way for artificial lysine in modern feed production. Feeds for poultry and pigs are the main outlet for lysine, but feeds for aquaculture, pets and fur animals have great potentials.